A 17" Rainbow Trout jumping out of the creel. 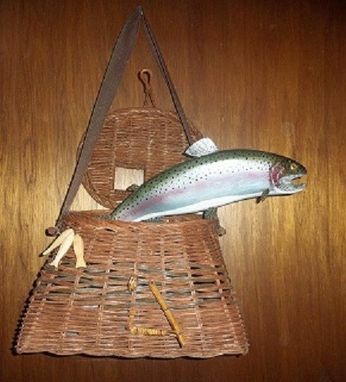 The two are not attached, so the creel can be used for fishing, and the Trout hung on your wall. Trout is carved of HI Density Urethane foam, handpainted and detailed. Great decor for home, den, cabin, lodge, or cottage. Realistic. Dimensions: 20" high, 10" deep, 18" wide.